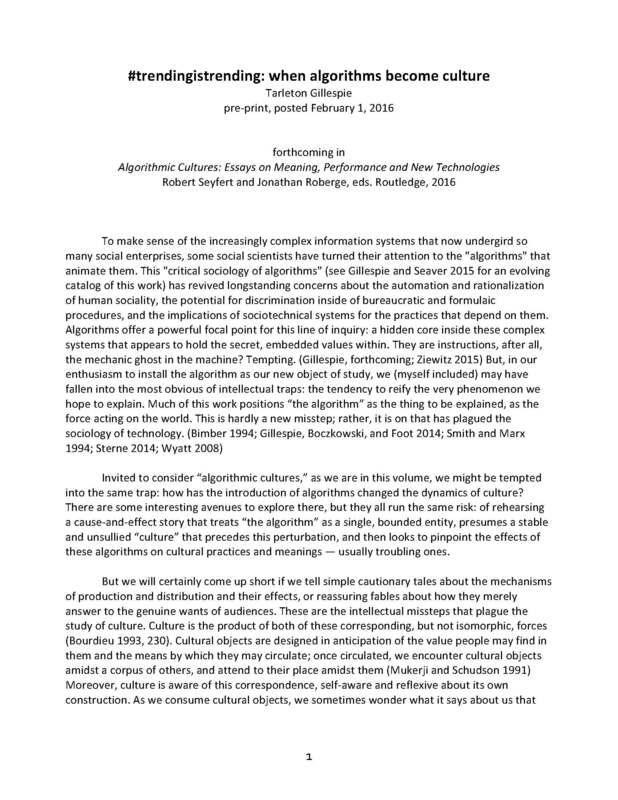 I wanted to share a new essay, “#Trendingistrending: When Algorithms Become Culture” that I’ve just completed for a forthcoming Routledge anthology called Algorithmic Cultures: Essays on Meaning, Performance and New Technologies, edited by Robert Seyfert and Jonathan Roberge. My aim is to focus on the various “trending algorithms” that populate social media platforms, consider what they do as a set, and then connect them to a broader history of metrics used in popular media, to both assess audience tastes and portray them back to that audience, as a cultural claim in its own right and as a form of advertising. The essay is meant to extend the idea of “calculated publics” I first discussed here and the concerns that animated this paper. But more broadly I hope it pushes us to think about algorithms not as external forces on the flow of popular culture, but increasingly as elements of popular culture themselves, something we discuss as culturally relevant, something we turn to face so as to participate in culture in particular ways. 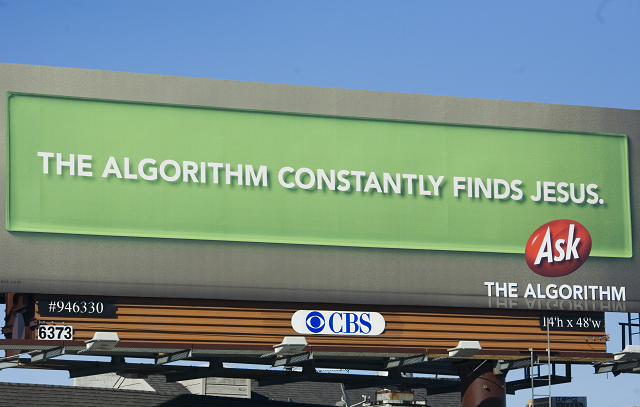 It also has a bit more to say about how we tend to think about and talk about “algorithms” in this scholarly discussion, something I have more to say about here. I hope it’s interesting, and I really welcome your feedback. I already see places where I’ve not done the issue justice: I should connect the argument more to discussions of financial metrics, like credit ratings, as another moment when institutions have reason to turn such measures back as meaningful claims. I found the excellent essay (journal; academia.edu), where Jeremy Morris writes about what he calls “infomediaries,” late in my process, so while I do gesture to it, it could have informed my thinking even more. There are a dozen other things I wanted to say, and the essay is already a little overstuffed. I do have some opportunity to make specific changes before it goes to press, so I’d love to hear any suggestions, if you’re inclined to read it. This post originally appeared on Cyborgology as part of its “Small Town Internet” issue. Since I was thinking about several SMC members’ research while writing this, and worked on this post while co-writing with Jessa Lingel, I thought it apropos to post it here as well. There’s a lot more to be said about rural internet experiences and larger issues around social media, infrastructure, internet policy, digital inequities, etc, and I hope to write more about some of these topics soon. I moved to rural Kansas a over a year ago. I live beyond Lawrence city limits, on the outskirts of Stull (where local legend places one of the gateways to hell), and 50 minutes driving to the nearest Google Fiber connection. It’s a liminal space in terms of broadband connection – the fastest network in the country is being built in the neighboring metropolitan area but when I talked to my neighbors about internet service providers in our area, they were confused by my quest for speeds higher than 1mbps. As this collection of essays on “small town internet” suggests, there’s an awareness that internet in rural, small town, and “remote” places exists, but we need to understand more about how digital connection is incorporated (or not) into small town and rural life: how it’s used, and what it feels like to use it. One of my ongoing projects involves researching digital divides and digital inclusion efforts in Kansas City. The arrival of Google Fiber in Kansas City, KS and Kansas City, MO has provided increased momentum and renewed impetus for recognition of digital divides based on cost, access, education and computer literacy, relevance, mobility, and more discussion and visibility for organizations and activists hoping to alleviate some of these divides and emphasize internet access as a utility. I’ve argued that by reading digital media in relationship to experiences of “place,” we gain a more holistic and nuanced understanding of digital media use and non-use, processes and decisions around implementation and adoption, and our relationships to digital artifacts and infrastructures. In other words, one’s location and sense of place become important factors in shaping practices, decisions, and experiences of digital infrastructure and digital media. The irony is not lost on me that while studying digital divides in a metropolitan area, I had chosen to live in a location with its own, unique series of inequities in terms of internet connection. These inequities have nothing to do with socio-economic instability or lack of digital literacy, as I had funds and willingness to pay a significant amount for internet service (comparable to the prices charged by urban-based, corporate ISPs), and everything to do with the fact that I lived in an area that felt as if it had been forgotten or intentionally bypassed by the internet service providers (ISPs) I had come to know living in other US cities and towns. In this essay, I want to recount a few of the ways that my relationship to internet infrastructure and ISPs has changed since moving out to the country. (My relationship to social media and my social and economic dependence on internet connection has shifted as well, which I plan to write about elsewhere.) 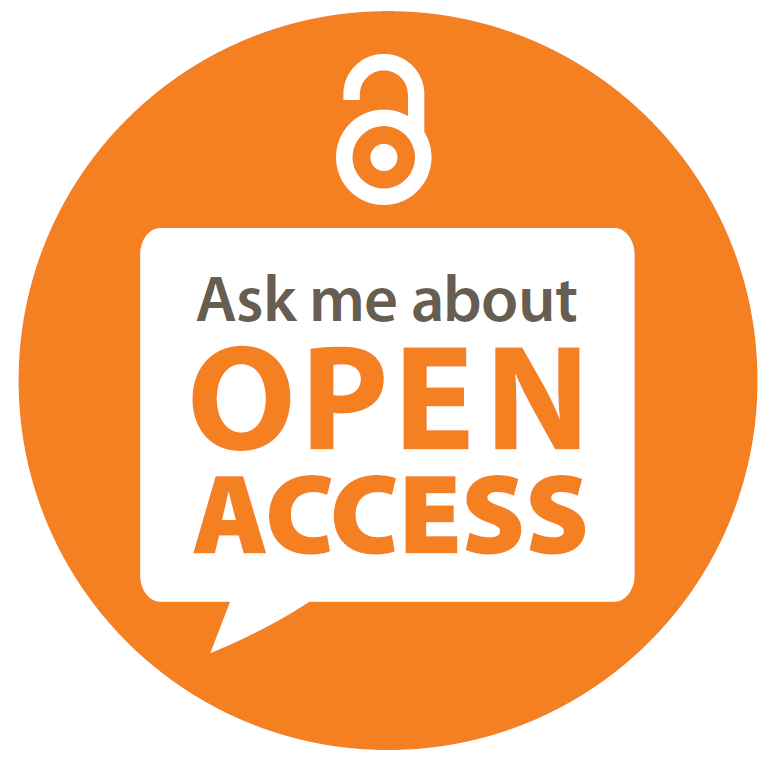 I’m speaking to my experience of digital connection and digital practices “after access,” from within a certain type of digital connectivity. I don’t claim that these interpretations or experiences are generalizable or representative, but they’re some of my initial observations having been an ubiquitously connected, digitally literate, urban dweller for the majority of my life and now living the last year and a half of residence in a rural place. After moving in, I realized that although our house was advertised as having “high speed internet,” this didn’t mean a wired, cable broadband connection or even DSL, as we weren’t in either of these coverage areas. An internet connection meant that we could connect via two strictly data-capped options: satellite, 4G provided by a cell phone company, or a pay as you go 4G connection. Various blogs and forums hosting threads on ISP options overflowed with warnings about the high prices, data caps, and unreliability of satellite internet connections in rural environments and otherwise. I posted on social media outlets and contacted friends about my frustrations with my internet access options and received suggestions to contact the cable company and ask them to expand their service to our area, offers to come to friends houses to use the internet, and empathy from people who grew up in rural areas sending condolences for the fact that I would never binge watch anything again. It might sound frivolous to some, but I admit that the thought of not being able to stream anything ever, Skype or share photos with friends and family members, and difficulty downloading large files did make me panic. I’d rather not fall victim to varieties of information, participation and culture gaps and I regularly need to stream, upload and download large files in order to do my job. The local cable monopoly first offered us service over an old Motorola Canopy network at a maximum of 1mbps upload and download speeds. I had never consciously thought about the sheer amount of emails I received that included or requested attachments until I was unable to send one consistently from my home computer. Before the end of the first week the sound of an email arriving in my inbox while I was at home made me anxious. It meant that I would have to wait until the next time I was in town to respond with a comment other than, “I can’t send the attachment until tomorrow, I have limited access to the internet right now,” a euphemism which frustrated me and I thought made me sounds like a slacker. I cancelled the service after the two-week trial. Now, I love my internet service provider, which is something I never thought I’d ever say. I have feelings of gratitude for them. They’re a local company who, according to their mission statement, saw “a lack of adequate Internet service options available to rural Northeast Kansas communities” and decided to build their own point-to-multipoint, line of sight network to service to our area. In 2008, they acquired another local ISP owned and operated by an area high school and later migrated their network from Motorola Canopy to 4G. They retrofitted the Canopy network antenna that the previous owner of our house had left, installed a 6 foot pole antenna on the roof of our house, and located a direct line of site to one of their towers. We now average around 5 mbps upload and download speeds. Although we experience noticeable lag time as compared to our workplace connections, and Skype, VoIP, and streaming often crash due to poor internet connection – we have a generally reliable connection with no data caps and at less than half the cost of any service provider in town. This type of internet connectivity looks and feels different as well. The equipment that powers my connection demands more conscious and haptic attention. The pole and antenna mounted to my roof are taller than the rest of the house and are the first things you see from the driveway. I can see part of the tower that powers my internet, as well as two others that use the canopy network, across the prairie. I have to tend to my equipment. I often have to touch the antenna and pole to adjust them after being blown by strong winds and I’m regularly unplugging and pushing buttons to reset the router. The “seamfulness” of the experience makes me think about the “wires” and wireless frequencies, how they work or don’t work and why, in a way I never did while living in cities. For me, the infrastructure is very tangible and visible, which makes me think of myself as a digitally connected person more than ever before. I feel more connected to my connection, and more responsible for making it work. I’ve wondered about the potential for mesh networks in my rural area. Mesh networks are decentralized, redundant, often inexpensive networks powered by antennae that act as both access points and routers, repeating wireless signals in a mesh-like configuration. In conversations with digital inclusion activists and community network organizations in urban areas, mesh networks are often suggested or already serve as a powerful alternative to more traditional ISPs and the networks they provide. However, the technical problem of distance persists as houses, barns, silos, garages, and other structures where antennae might be mounted can be over several miles away. More complicated is the fact that the pre-existing social structures and norms around proximity and sharing are also very different from cities or more densely populated areas. People who live out here tend to live “alone together.” I live closer to and encounter my neighbors’ cows, dogs, goats, and chickens than the people who own them, and where minimal (albeit friendly) interaction between people is the norm. There’s not much we share in terms of services and utilities: we pay for utilities individually, often from different service providers. The area is purely residential for miles and the commercial and family farms and orchards don’t have direct sales on premises. In many ways each household feels like a self-sustaining unit with their individual tanks of propane, tornado shelters, livestock, and food crops. I often wonder how introducing an infrastructure built on shared internet connection would mesh with these pre-existing social networks. But at the same time, I wish someone would propose a network like that out here, or finally send up those balloons. We all have preferences for how we work. Maybe you’re the kind of person who likes to work in complete isolation, in which case this blog post is not for you. But if you’re like me, there’s something appealing about being deeply engaged in your own work in proximity to people who are also being productive. This is why I have long struggled to work at home and instead tend to write in coffee shops and libraries. I’ve also experimented with more intentional forms of co-working. For many years, my most successful attempt was with my friend Stephen. As a DJ, Stephen would work on mixes and set lists, while I would typically revise papers – beyond the fact that we’ve been friends for years and enjoy hanging out, I think we both got a lot out of the gentle pressure/quite support of collocated work. In the last few years, I’ve made several other efforts at co-working, spanning in-person, online and inter-species collaborations (#noclickbait – it’s not as exciting as it sounds), which I thought I’d share below. If you have other ideas for coworking, feel free to share them in the comments! But given that we want to achieve these “transparent” algorithms, how would we do that? Manfred Broy, writing in the context of software engineering, has said that one of the frustrations of working with software is that it is “almost intangible.” Even if we suddenly obtained the source code for anything we wanted (which is unlikely) it usually not clear what code is doing. How can we begin to have a meaningful conversation about the consequences of “an algorithm” by achieving some broad, shared understanding of what it is and what it is doing? The answer, even among experts, is that we use metaphor, cartoons, diagrams, and abstraction. As a small beginning to tackling this problem of representing the algorithm, this week I have a new journal article out in the open access journal Media-N, titled “Seeing the Sort.” In it, I try for a critical consideration of how we represent algorithms visually. From flowcharts to cartoons, I go through examples of “algorithm public relations,” meaning both how algorithms are revealed to the public and also what spin the visualizers are trying for. The Google algorithm as a robotic nose that smells Web pages. In the fall of 2009, I sent the manuscript for my book Personal Connections in the Digital Age off to press. I’ve just finished the index for a second edition, which will be published by Polity in mid-2015 (in time for fall classes!). The list of terms I added provides a fun little peek into the last 5 years of digital media and social life. What would you have added? What words would you expect to see in a third edition? Does collaboration result in higher quality creative works than individuals working alone? Is working in groups better for functional works like code than for creative works like art? Although these questions lie at the heart of conversations about collaborative production on the Internet and peer production, it can be hard to find research settings where you can compare across both individual and group work and across both code and art. We set out to tackle these questions in the context of a very large remixing community.